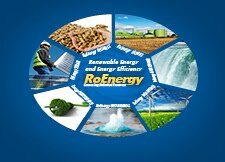 In 5 to 7 June 2013, the RoEnergy Trade Fair returns in Bucharest - the capital of Romania, at ROMAERO, the third edition, announcing to be an Event with strong impact on the RES industry in Romania. Investors thus are reconfirming their interest for the Romanian RES market as an response and alternative to the limitation of the European energy markets. So far have reserved to the RoEnergy Bucharest Trade Fair 2013 companies from Germany, Italy, France, Poland, Bulgaria, Greece, Hungary, USA, China, Romania) and registrations continue, announcing to be one of the biggest Event of this kind in Romania. To the most important Trade Fair for renewable energy in Romania, the exhibiting companies are coming from solar photovoltaic domain, bioenergy (biomass, biofuels, biogas), wind energy, hydropower, energy infrastructure, energy efficiency in buildings. Parallel with the Exhibition for 3 days at ROMAERO will be a series of events organized in collaboration with professional associations, universities and companies. Solar Energy Conference in Romania: PV industry - opportunities and challenges, having as sections: How much energy can a roof produce, Photovoltaic projects - Opportunities and Challenges, Management and Energy Performance (June 5, 2013), Bioenergy (biomass, biofuels, biogas) in factories and farms - between reality and possibility (June 7, 2013), New capacity and environmental performance of energy production - the further development engine of Romania (wind energy, solar energy) (7 June 2013), Small Hydropwer Plant 2013 - problems and solutions ( June 6, 2013), etc. Experts, RES managers, representatives of authorities, researchers and the media will have the opportunity to exchange opinions and specialized know-how.